Disclaimer: I received the Majestic Bombay Double End Dog Dental Tooth Scaler Tartar Remover + Stainless Steel Dental Inspection Mirror for free in exchange for my honest, unbiased review. All opinions are my own. There are also links to products I recommend from companies I have a referral relationship with. I will be compensated if you make a purchase after clicking on my links. Dog tooth dental care is essential for the health and longevity of your pet. 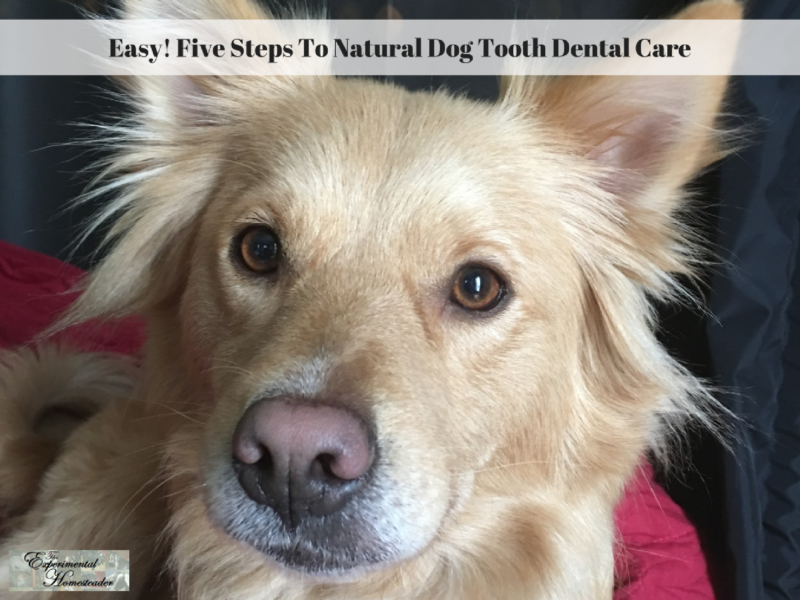 Caring for your dogs teeth at home using natural methods is given more emphasis nowadays. One reason for this is because of the fact that numerous dog dental diseases are emerging. Caring for your dogs teeth at home allows you to know immediately if something is wrong with your pets teeth. Sometimes it is simply hair stuck in them that needs removed, but if you suspect your pet is developing dental diseases, then immediately contact your veterinarian for intervention. Here are five easy steps you can take to help keep your dog’s teeth clean. Raw beef bones is a natural way to help keep your dogs teeth clean and free from plaque formation but be sure the bones are free of sharp points. What many people do not know is when plaque builds up there is also bacterial organisms that develop. Most dogs love to chew on the bones and then swallow the bits of bone they chew off. Chewing on bones helps them develop strong teeth structures in a natural manner which is important. Keep in mind that the some breeds of dogs such as Pekingese, Chihuahua, Pomeranian and poodles are more prone to the developing dental disease because the teeth are closely crowned in the oral cavity of smaller dogs. Be sure your veterinarian checks your pets teeth on a regular basis for excessive plaque formation. There are dog dental tool kits you can use at home such as the Majestic Bombay Double End Dog Dental Tooth Scaler Tartar Remover + Stainless Steel Dental Inspection Mirror. Your dogs teeth are pretty important and need to be kept clean just like ours do. There are a lot of reasons why you would want to use a dog dental tooth scaler tarter removal and dental inspection mirror instead of just relying on pet treats to remove all the tarter. Of course these tools have other uses too, especially for senior dogs or dogs who chew themselves a lot and get their own fur stuck in their teeth. I have had two senior dogs who have done this. The first one was Justice and she belonged to my step dad. He complained non-stop about how bad her breath smelled. She was a biter and thus I was unable to look in her mouth. I took to the vet to find out what was wrong with her. The vet found wads of hair in her mouth. Once the hair was removed, we found out she had other dental issues due to the hair being there for so long. In fact, eventually I was able to get her to let me clean her teeth. The second dog I have had issues with is Precious Angel. I knew right away from the foul smell on his breath what was happening. I got him when he was just 2 weeks old and have worked with him since so getting him to let me clean his teeth was not an issue. I used to use tweezers because that was all I had so when I had the chance to get the Majestic Bombay Double End Dog Dental Tooth Scaler Tartar Remover + Stainless Steel Dental Inspection Mirror I went for it. I suspected – even before seeing the product in person – that it would assist me in cleaning his teeth much better than tweezers. I was right and he doesn’t seem to mind me using the dog dental tooth scaler on him. In fact he prefers it. He no longer tries to put his head down or go into another room when he sees me coming with the tools. I like how easy the tools clean. I like that the mirror is easy to remove from the handle so I can get it extra clean. I like the individual tool pouches that both tools come in. They are made of stainless steel and I have not had an issue gripping them due to the non-slip knurled handle. I am sure these tools would work well on other animals too. If you have pets, look into them. If you have senior pets who chew and get hair stuck in their teeth, these tools are a necessity plain and simple. The Dental Tooth Scaler features a 6-1/2-Inch Double Headed Pet Tarter Remover. The Mirror features .85″diameter real glass for superior clarity. The Non-slip Knurled Handle Ensures Accuracy and Comfort. Simply Wash and Dry after Each Use. Pet dental brushes are but should be used with dog safe tooth pastes. Some people use a natural baking soda and others prefer to use a tooth paste recommended by their veterinarian. It is not recommended to use any type of tooth paste meant for humans because of the high-foaming detergents and abrasives found in them. Mix this up and use it right away to brush your dogs teeth. Another option is to give your dog treats that are designed to remove tartar and the plaque from their teeth. Look for dental treats that have the Registered Seal by the Veterinary Oral Health Council (VOHC) so you avoid giving your dog treats that are too hard and may cause teeth fractures. There are also toys that are specially made to aid in cleaning a dogs teeth. Many people believe dry dog food helps, and while it is true that it does remove some plaque, research has not proven that it will prevent dental disease, according to PetMD. Dental wipes are another option available at pet shops. They claim to remove plaque and tartar as well as materials that are loosely attached however there is no proof at this time that they prevent periodontal disease. An alternative to using pre-moistened dental wipes is gauze.